Occasionally, the project administrators of the American Indian project at Family Tree DNA are presented with a rare opportunity to test an individual who is either full-blooded Native or nearly so. Recently, a Native Sioux man, John Iron Moccasin, born Earl White Weasel, stepped forward. In order to facilitate testing, project members and others contributed funds with the agreement that we could publish John’s results and story. 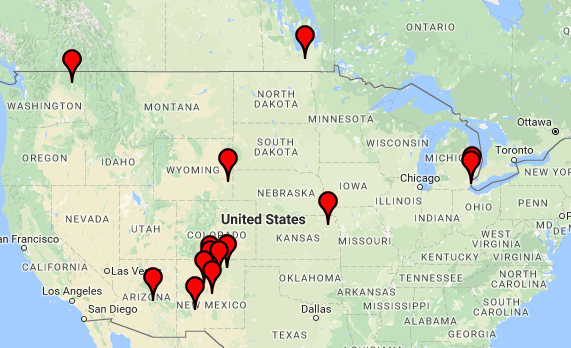 Now that the original tests are complete and we are publishing his results, we would like to upgrade John’s Y markers to 111 (from 37) and add the Big Y test – so if you’re inclined to contribute to the American Indian Project for this advanced testing – you can do so by clicking here. But first, perhaps you’d like to hear John’s story. The results of the research into John’s history, both genealogically and genetically are fascinating. I hope you’ll get a cup of coffee or tea and enjoy this journey. 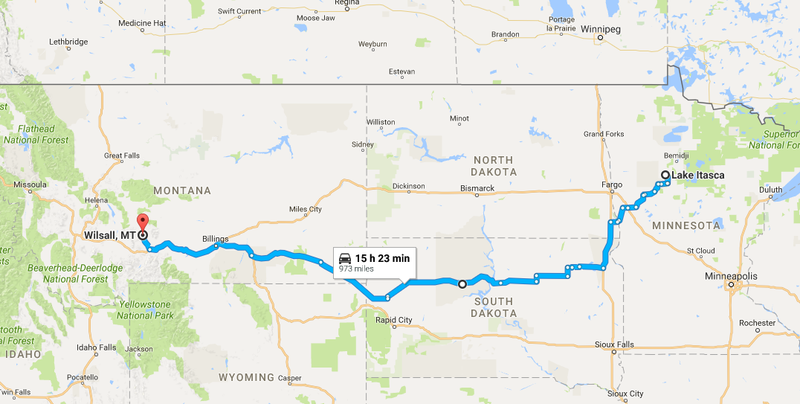 Come along – we’re going on an adventure to South Dakota and we’ll be visiting the Sioux people! A few months ago, John Iron Moccasin was talking to his friend and told her that he would like to share not only his oral history, but his genealogy and genetic history, with his daughter. He didn’t know how to go about doing either, but that friend, Pam, did, and she turned to me. John was born as Earl White Weasel on Eagle Butte Reservation in South Dakota. He then lived at Cherry Creek Reservation in South Dakota. After adoption, he relocated to Pine Ridge Reservation, Kyle Reservation and then Oglala Reservation. Unlike many adoptees, John always knew the identity of his birth parents and has given permission to use both his birth and adopted surnames. He takes pride in both, as well as his heritage. However, since John’s genetic genealogy is connected only with his biological parents, that’s where this article will focus. Both of John’s biological parents belonged to the Cheyenne Sioux tribe. His birth father was Timothy Urban White Weasel and his birth mother was Martha Hale. John is tribally enrolled with the Cheyenne Sioux based on his birth parents. John’s card shows his “degree of blood” to be at least 15/16ths. Let’s take a look at tracking both John’s maternal and paternal ancestry. Many people ask how to work with Native records, and this article will follow my step-by-journey with both John’s traditional genealogy as well as his genetic genealogy, tracking each line back in time. But first, let’s look at the history of the Sioux people. The Sioux are groups of Native American tribes and First Nations peoples in North America. The term can refer to any ethnic group within the Great Sioux Nation or to any of the nation’s many language dialects. The Sioux comprise three major divisions based on language divisions: the Dakota, Lakota, and Nakota. The Santee Dakota reside in the extreme east of the Dakotas, Minnesota and northern Iowa. 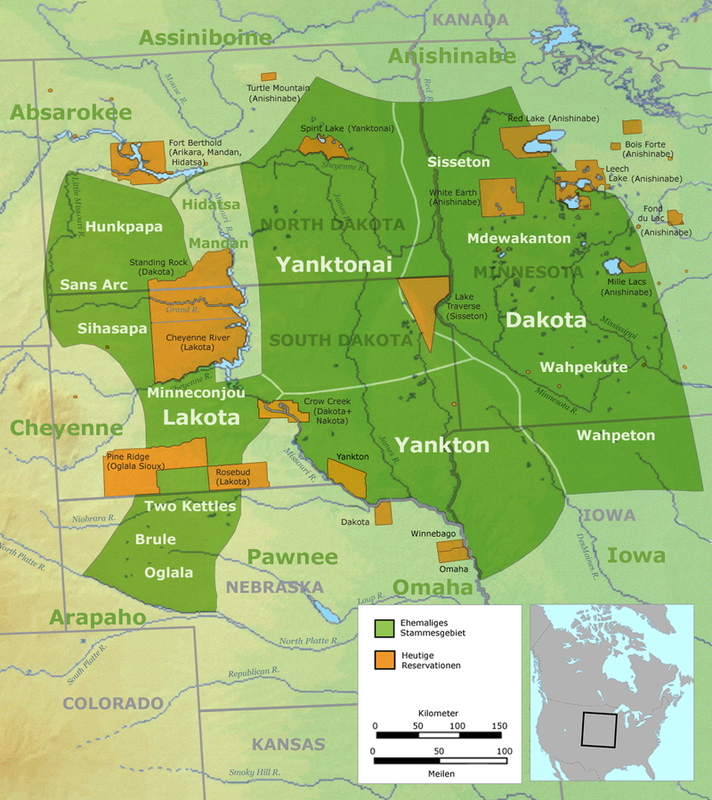 The Yankton and Yanktonai Dakota reside in the Minnesota River area. They are considered to be the middle Sioux, and have in the past been erroneously classified as Nakota. The actual Nakota are the Assiniboine and Stoney of Western Canada and Montana. The Lakota, also called Teton are the westernmost Sioux, known for their hunting and warrior culture. The Treaty of Fort Laramie in 1868 established the Great Sioux Reservation, shown below, much of which has been whittled away today. The Dakota are first recorded to have resided at the source of the Mississippi River during the seventeenth century. The source of the Mississippi trickled out of Lake Itasca in present day South Clearwater, Minnesota. 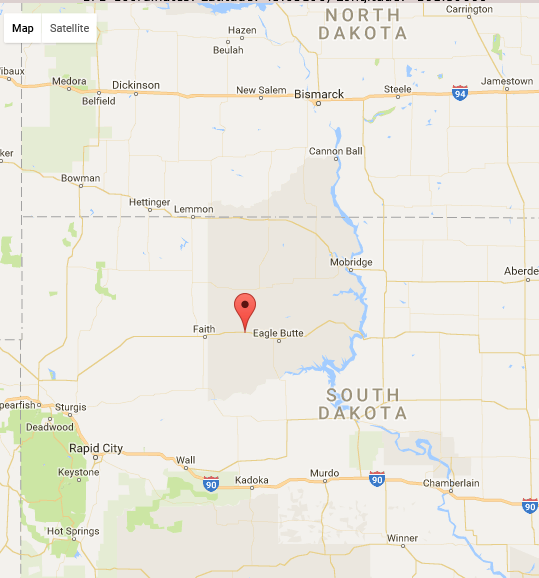 On the map below, you can see that location as well as Eagle Butte, to the west (larger white circle in South Dakota), some 300 or more miles as the crow flies, where John Iron Moccasin was born. The third location, Wilsall, Montana, on further west (red balloon), is where the remains of the 12,500 year old Anzick Child were found with Clovis tools. 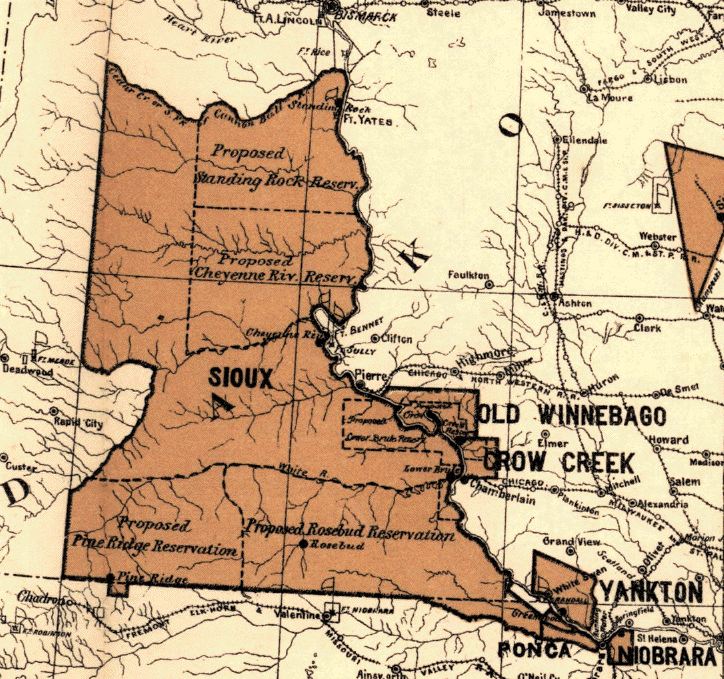 By 1700 some Sioux had migrated to present-day South Dakota. John’s Native ancestors were born in North Dakota, South Dakota, Montana, Nebraska and reportedly, Canada. Late in the 17th century, the Dakota entered into an alliance with French merchants. The French were trying to gain advantage in the struggle for the North American fur trade against the English, who had recently established the Hudson’s Bay Company. The first recorded encounter between the Sioux and the French occurred when Radisson and Groseilliers reached what is now Wisconsin during the winter of 1659-60. Later visiting French traders and missionaries included Claude-Jean Allouez, Daniel Greysolon Duluth, and Pierre-Charles Le Sueur who wintered with Dakota bands in early 1700. In 1736 a group of Sioux killed Jean Baptiste de La Vérendrye and twenty other men on an island in Lake of the Woods. However, trade with the French continued until after the French gave up North America in 1763. For the most part, Sioux contact with Europeans was very limited until in the 1800s, and then, it turned deadly in a series of “wars” as the Sioux tried to protect their land and way of life. Europeans were equally as determined to eradicate the Indians, take their land and eliminate their way of life – and ultimately – they succeeded by containing the Sioux on reservations. Records, other than oral history in the Sioux tongue, didn’t begin until Europeans began keeping them, so our earliest genealogical records of the Sioux only reach back into the 1800s. Thankfully, genetic records can reach back infinitely into time. Let’s visit John Iron Moccasin’s ancestors, beginning with John’s paternal line. John’s father was Timothy Urban White Weasel, born August 1, 1939 to Oscar White Weasel and his wife, Esther (also called Estella) Ward. Timothy died March 28, 2004 in Eagle Butte, Dewey County, SD, the same location where he was born. John’s grandfather, Oscar White Weasel is listed as a farmer in the 1930 census in Ziebach County, South Dakota, in Township 8, district 59 as a full blood Sioux male with a note “74-5,” speaking Sioux, as is his wife, Esther, age 24. They have been married 5 years and have two children, Margie age 4 & 9/12 and Beatrice, age 2 & 5/12th. Oscar is a veteran. This means John’s grandfather was born about 1898 and his grandmother about 1906. It should be noted that many traditional Native people have only a general idea of when they were born. 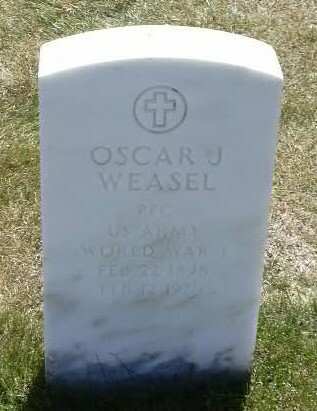 The US Department of Veterans Affairs Death File shows that Oscar Weasel was born on Feb. 22, 1898 and died on February 12, 1979. His military service was from March 28, 1917 to May 12, 1919. The 1940 census from the same location shows Oscar J. White Weasel, age 42, wife Esther M., age 38, both Indian, both born in South Dakota, both educated through 7th grade, with 5 children including baby Urban J. White Weasel, age 7/12th. They live in Cherry Creek in Ziebach County, SD in the same place they lived in 1935. The Rapid City, SD obituary index shows that two obituaries for Oscar exist. 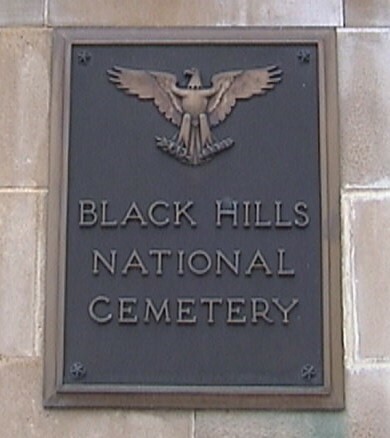 BHN means that Oscar is buried in the Black Hills National Cemetery. Find-A-Grave shows that he is buried in Section C, site 455 and that he was a PFC in WWI. The Social Security Claims Index shows that Oscar’s wife was Esther Ward and their child that filed the claim is Beatrice Louise Janis. The 1927 Indian Census of the Cheyenne River Sioux Agency provides a little more information. Joseph, also known as Oscar White Weasel is listed as born in 1898 and with two numbers instead of an English name. 322986 and 328110. I suspect these are the governmental identification numbers assigned to his parents when they were paid from the settlement fund – although one of those numbers could he his. His wife is listed as born in 1903 and as Mrs. Joseph White Weasel, nee Esther Ward, and she has one number listed in place of English name, 359087. Their daughter Margie is listed as born in 1925 and has no number listed by her name. There are no additional White Weasel individuals listed. The 1925 Indian Census (below) shows us that he is listed as Joseph with Oscar penciled in above the name, with the number 322986 beside his name – which is evidently his number. The numbers probably related to the numbers assigned to Indians on the Dawes Rolls resulting from the Dawes Act of 1887 which allotted tribal lands in severalty to individual tribal members in exchange for Native Americans becoming US citizens and giving up some forms of tribal self-government. In the South Dakota 1925 census, Joseph White Weasel is listed as married in 1924 and as Catholic. 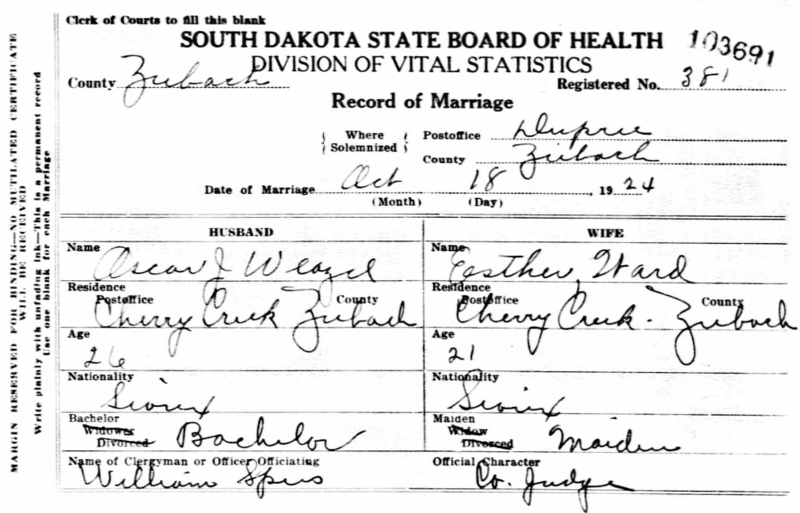 The South Dakota Marriages lists them as having married on October 18, 1924 in Cherry Creek. Many of the Native people were “converted” to Catholicism by missionaries. The French were Catholic and the traders in this region and throughout the Great Lakes were French. The 1900 federal census (below) lists Joseph White Weasel, born in 1898 as the son of Charley White Weasel born in April of 1866 in South Dakota. They are living on the Cheyenne River Indian Reservation, district 48 in Dewey, County, South Dakota. Joseph’s mother is “Follows” and she was born in July of 1869 in Montana, as were both children. They have been married 12 years, had 5 children, and 2 are living. Joseph’s older brother is Wakes (probably Makes) Believe his (probably he’s) Running. Charley is listed as “Indian Police” and Follows is listed as “Ration Indian.” They have not attended school, cannot read or write and do not speak English. This entire family is listed as Sioux, with no white blood. The mother and father of both Charley and Follows are listed as Sioux as well. They are not polygamous and they lived in a fixed, as opposed to moveable, structure. In other words, a “house” of some sort, not a teepee. Polygamy was considered a grave sin by most Christian religions, and clearly someone still practicing the Native ways, which includes both polygamy and living in teepees, was highly encouraged to abandon those practices. Note in the Indian census as late as 1902, some households are still listed with wife 1 and wife 2. It’s impossible to tell which child was born to which wife. Also note that the Native name and English name may have nothing to do with each other. They are not always literal translations. Please also note that Follows Him, above, is not the same person as Follows. Christianity, and specifically Catholicism, along with “civility,” meant taking English names and living in established locations in structures. These behaviors were strongly encouraged and then forced upon the Native people with the Indian Citizenship Act of 1924 when their children were sent to “boarding schools” to learn the white ways, renamed, and it became illegal to practice the Native ways, including spiritual practices, powwows and speaking their own language. These restrictions lasted until the Native American Languages Act of 1990 which once again allowed Native people to speak their own language and the 1978 American Indian Religious Freedom Act allowing Native people once again to hold events such as powwows and practice their own belief system. Unfortunately, the half century plus between 1924 and 1978/1990 successfully eroded and destroyed much of the Native cultural heritage. Follows continues to be listed in the Indian census documents. 1895 is shown below. The 1897 Indian census (below) shows Follows and White Weasel with Makes Believe he is Running and a new child, aged 2. This child is not yet named, which makes sense in the Indian culture because children are not named until they “earn” a name of some sort. In some tribes, names are changed as new names are earned. The family is also shown in the Indian Census of 1899 (below) where Joseph has been named, in 1900, in 1902 when Lucy has been born, in 1903, in 1904, in 1906 when Lucy is no longer with them, and in 1907. The June 30, 1909 Indian Census shows Follows, age 40, but White Weasel is gone and she is shown with both sons, below. The 1910 federal census shows a Louise Weasel on the Cheyenne River Indian Reservation, with sons Peter age 17 and Oscar, age 11. I don’t know if this is the same family with white names, or this is a different family. I suspect that Follows has been “renamed” Louise for the federal census document. The 1910 Indian census shows Follows with both boys again as well as in 1911, 1913, 1914, 1915, 1917. In 1918, Follows is shown with only Joseph. I cannot find either Follows or Joseph (Oscar) White Weasel in the 1920 census, although he was clearly living because he married in 1924. It’s unclear when Follows died. 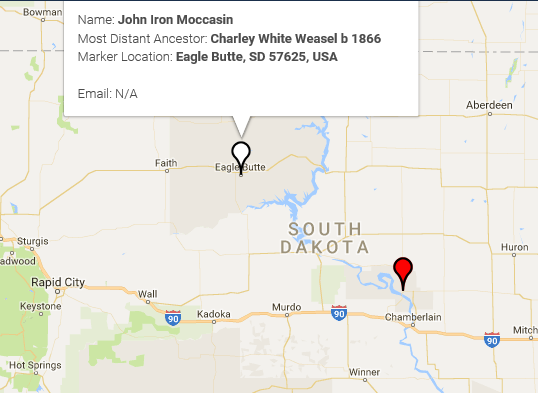 John’s grandmother, Esther Ward is listed as Esther White Weasel born in 1904 on the 1945 South Dakota Census, with both of her parents born in South Dakota. 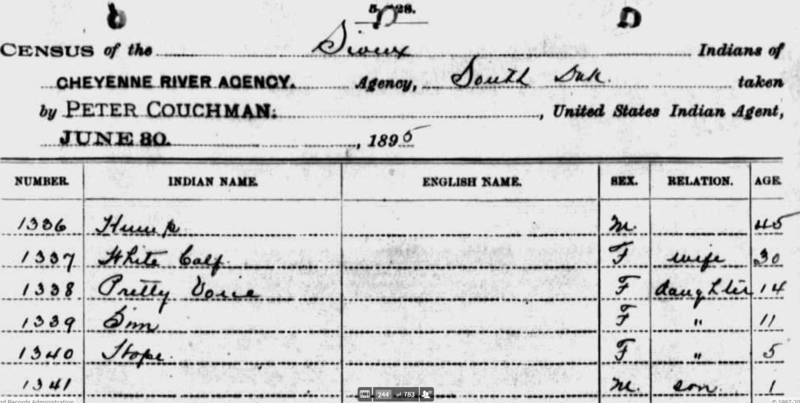 On the 1910 federal census, Esther Ward is 6 years old living with her father, Alfred Ward, age 32, married 13 years, and his wife Nellie age 28. They have another daughter, Mary, age 12 and (apparently) a son, Alec Chasing Hawk, age 2. Alec’s father is listed as having been born in Montana and mother South Dakota, white everyone else and their parents are listed as born in South Dakota – so Alec is a bit of an enigma. They also live with a man I would presume to be Alfred Ward’s’s father, although he could be Nellie’s father, as he is listed only as “father” but generally that is the relationship to the head of the household. Jerome Chasing Hawk, age 78, so born in about 1832, widowed, Sioux, a Ration Indian. However, we later discover that Alfred Ward’s father is Clarence “Roan Bear” Ward and his mother is Estella DuPris, so the identity of Jerome Chasing Hawk is quite a mystery. Ration Indian means that they are receiving rations from the Bureau of Indian affairs, often in exchange for land traded by the tribe. Alfred raises stock and both Alfred and Nellie can read and write, but Jerome cannot. In the special inquiries section, Alfred Ward is listed as ¾ Indian and ¼ white, married once, not living in polygamy, received an allotment in 1908 and is living on his own land. Nellie is listed as full Indian, received an allotment in 1909 and has been married once. Jerome Chasing Hawk is listed as full, married twice, not living in polygamy, and received an allotment in 1903. He is not living on his own land. The 1900 federal census shows Chasing Hawk, a widower, as the father-in-law of Dirt Kettle, whose wife is Woman Eagle. Chasing Hawk is 68 and was born in May of 1832 in South Dakota. His father was born in an unknown location and his mother was born in North Dakota. He is a Ration Indian and does not read, write or speak English. In the special inquiries section, Chasing Hawk is noted with other name as “Cetan, unknown” and that he is full Native. I did not solve the mystery of Chasing Hawk’s relationship to this family. If Alfred Ward is indeed ¼ white, then John Iron Moccasin is 1/32nd white, assuming all other ancestors were full Native. The 1900 federal census shows Alfred Ward, age 22, with wife Pretty Voice, age 16 and daughter Irelia Ward, age 1. Pretty Voice appears to be Nellie’s Native name. In the special inquiries section, Alfred is listed with both parents being Sioux, but listed as half white. Pretty Voice is listed as Sioux, all Indian with no white. He can speak English, she cannot. Alfred is shown in the photo below. On the 1925 Indian Census Roll, Alfred and Pretty Voice are both shown. He has number 246235 or 246285 next to his name and she has 248261 beside her name. They have 3 children. On the 1931 Indian Census Roll, Joseph White Weasel is listed with his wife, Esther, with their roll numbers and the identification numbers of their allotment, annuity and identification numbers. On the 1895 Indian census, Pretty Voice is listed as the child of Hump and White Calf is listed as Hump’s wife, although we will see in a minute why that may not mean that White Calf is Pretty Voice’s mother. This is a very interesting development, because Hump and White Calf are also in John Iron Moccasin’s mother’s line, as are Clarence Ward and Estella DuPris. The 1886 Indian Census shows Hump, age 45, with wife Beautiful Hail, age 26, and daughter Pretty Voice age 3 and Her Voice, age 2. This strongly suggests that Pretty Voice’s mother was Beautiful Hail and not White Calf. The 1891 Indian Census labeled “Sioux of different bands” shows Hump, age 43, his wife designated only as “Mrs.” age 21, With Pretty Voice, age 9, Sun age 6 and Hope or Hoop age 2. The 1892 Indian Census shows that Hump, age 42, married to White Calf, with daughter Pretty Voice, age 11, Sun age 8 and Hope age 2. Her Voice is not with the family, so presumably has died. Pretty Voice is reported on another tree maintained by YanktonSiouxTribe, who indicates they are a professional genealogist, to be the daughter of Chief Hump, friend and mentor to Crazy Horse. YanktonSiouxTribe reports that Pretty Voice married Alfred Ward, son of Roan Bear also known as Clarence Ward and Estella Dupris, the daughter of Fred Dupris and Good Elk Woman whose photo is shown below. In the 1895 Indian Census, Alfred Ward is shown living with his parents, Clarence Ward and Estelle Ward, ages 44 and 40, respectively. They would have been born in 1851 and 1855. Clarence and Estelle’s youngest son, Willie, is also John’s ancestor through his mother’s line, having married Hope (Dora) Hump. It’s interesting to note in reviewing the Indian census records that in the mid-1890s, many Native people did not have an English name. Some had both, but far less than half in this tribe. However, by the 1920 federal census, they all had white names. The 1900 census shows us that Clarence Ward was born in July of 1850 in Nebraska and his parents were both born in South Dakota. He is listed as Missionary R and his wife is listed as a Ration Indian. The “R” is noted beside a number of occupations, so I would presume he is a missionary and the R may indicate “ration Indian” as well. They have been married 21 years and she has had 5 children, 4 of whom are living. In the special inquiries section, Clarence is listed as Sioux, as are his parents. Estella and her parents are also listed as Sioux, but she is listed as one half Native. In 1920, Clarence Ward was living, age 67, no occupation, wife Stella, age 64. Both were born in South Dakota and are living on the Cheyenne River Indian Reservation in SD. Clarence is reported to have died in 1933. Stella, or Estella DuPris, was born in August 1854 to Frederick DuPris and Good Elk Woman and died on July 6, 1927. Stella married Clarence Ward (shown below), who was born in 1851 in Nebraska. In the 1886 Indian Census, Clarence is shown as 35, Estelle as 31 and Alfred as 9. The 1900 Federal census shows Clarence as a Missionary, Estelle as born in South Dakota, her father born in France and her mother born in South Dakota. Stella’s father, Frederick Dupris, was born in 1813 in Quebec City, Quebec and died in 1898. He had 10 children with Good Elk Woman between 1845 and 1870. He died on June 16, 1898 in South Dakota. Good Elk Woman, also known as Mary Ann DuPris, died on February 13, 1900. 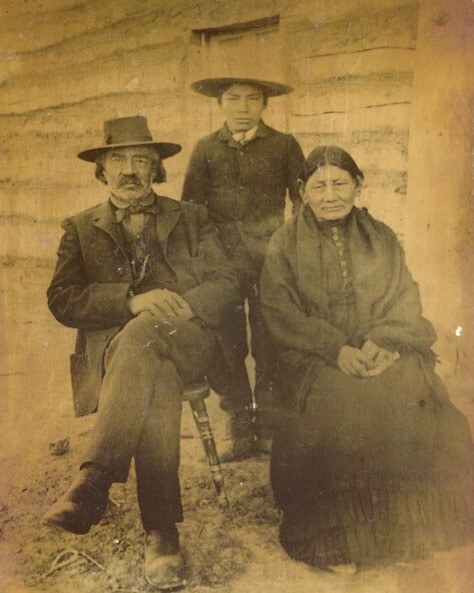 Photo of Fred DuPris and his wife, Good Elk Woman and Son, Xavier Dupris, courtesy, South Dakota Historical Society. In case there is any question about whether Fred DuPris was 100% white, the 1900 census lists his son, Fred Dupris as Sioux, father white, mother Sioux and he being one half Native. This, of course, indicates that Fred Sr. was all white. In the Indian Census of 1894, Good Elk Woman is listed as age 68 and is living with her daughter. Good Elk Woman was the daughter of One Iron Horn born about 1805 in South Dakota and Red Dressing born about 1810. Good Elk Woman was originally married to hereditary chief, Henry Makes Room and had a son, Henry Makes Room Junior. The following information was provided by Calvin Dupree. Frederick Dupuis came from Longueil, Quebec to Kaskaskia, Illinois and from there to the Cheyenne River area. One Dupuis brother, Pierre (known as Peter), went on up into Montana where he married an Assiniboin Sioux woman. A French-Canadian, Fred Dupuis arrived at Fort Pierre in 1838 and was in employee of the American Fur Company under Pierre Choteau, Jr. Letters from the winter of 1861 were written to Charles Primeau from Fred Dupuis by M. C. Rousseau at the mouth of Cherry Creek. The letters were concerned with reports of the Indian bands and the number of buffalo robes Fred was sending in and a list of the materials he needed for trading and maintaining his small outpost at the mouth of Cherry Creek. The trader (Fred) was concerned that the buffalo were becoming scarce and that the Indians and their horses were “poor”. After being an independent trader for some time (and probably as the buffalo dwindled and the Indians were put on reservations) Fred became a stock grower. He built the family home in a beautiful wooded flat on the north side of the Cheyenne River, thirty-five miles west of where it emptied into the Missouri. The patriarchal home was described as being 20 feet by 60 feet, and built of cottonwood logs. As each son or daughter married, a new small log house (called a tipi by the family) was built. These homes had dirt floor and gumbo roofs and were placed in a row near the main house. In addition there were usually a dozen tipis nearby, pitched by the full blood relatives of Mary Dupuis. The living arrangement was truly communal; the women had a large vegetable garden; the men worked the stock; all the cooking and eating was done in one cabin. One of the women baked all the bread, another cooked the meat and vegetables, and another made coffee and served the food. Three times a day 52 people ate together, along with any strangers or friends who might happen along. The marriage of Marcella Dupuis, Old Fred’s youngest daughter, to Douglas F. Carlin, a non-Indian, of Pierre must have been a noteworthy event since newspapers from Deadwood and Pierre covered the event. Mr. Carlin was noted as the issue clerk at Cheyenne Agency. The ceremony was performed at the Dupuis home on the Cheyenne River with many important persons from the city, including the Pierre City Council, and unknown numbers of Sioux present. Forty fat steers were to be roasted. All the wedding gifts were put on exhibition after the supper, the most impressive being five hundred head of cattle and fifty ponies from Old Fred, father of the bride, and a decorated buffalo robe from sisters of the bride. The Sioux dancing continued for three days with the only interruption being a pause for more eating every three hours. The Dupuis family’s contribution to saving the buffalo. In 1883 (or possibly earlier) Old Fred and some of his sons and possibly Basil Clement (Claymore) went on a hunt for some buffalo calves in order to start a herd. By this time the great “surrounds” of the past were over and I can imagine that the desire to preserve at least a few of these animals, so necessary and so sacred to the Indian people, was strong. The group headed northwest from the Cheyenne River and was gone for many months and in Montana, or near Slim Buttes (reports differ), they located a small herd. They finally secured five calves (one report says nine), which were loaded into wagons brought along for that purpose. The calves were taken back to Cheyenne River. By 1888 from this small start the Dupuis had nine pure-blood buffaloes. By the time of Old Fred’s death in 1898 the herd had grown considerably, and was purchased by James (Scotty) Philip of Fort Pierre. By 1918 (the herd) had increased to approximately 500 head. The State of South Dakota purchased 46 of these buffalo and transferred them to the State Game Park in Fall River County. Hearsay has it that Scotty Philip sold buffalo to other states and parks also, spreading the original Dupuis stock back into many areas where the buffalo once roamed free by the millions. Old Fred died in 1898 at about age 80. Then, as now, a death was the occasion for sharing through a Give-Away of all the deceased’s belongings. From Aunt Molly Dupris Annis Rivers, Old Fred’s grand-daughter, I have heard the colorful story of how some of the Dupuis wealth was distributed. It is said that according to Lakota custom, any one who happened by was entitled to a gift and this even included a group of Crow Indians, traditional enemies of the Sioux since anyone can remember. The Crows were invited to join the other guests as they filed by a horse whose saddle bags had been filled with silver dollars. Each person took a silver dollar until they were gone; the next person in line was given the saddle, and the last person received the horse. And in this way, and probably by several other methods, Old Fred’s money and property were shared with the people. None of his oft mentioned wealth was inherited by any of his family. Records indicate that Good Elk Woman, Mary Dupuis, died in 1900 at the home of her daughter, Mrs. Tom (Alma) Blue Eyes. One can only wonder about her life after Old Fred died, just as one wonders about her years of living, first as a child at Cherry Creek, then as a young wife of Makes Room and finally as Mary Ann Dupuis, mother of nine half French and half Lakota children. No stories about Mary have come down to me. Her life during the early time of tragedy and defeat for the Indian people cannot have been an easy one. Old Fred and Mary, and many of their descendants, are buried in the Dupuis Cemetery on the hill above the river flat where their family home once was. Nearby is the old ”Buffalo Church”. Old Fred and Mary may be gone, but South Dakota will not forget them. Dupree Creek runs into Rudy Creek and then into the Cheyenne River near the old home site, and the (town) of Dupree is located about 40 miles north of Cherry Creek where Old Fred carried on his fur trading. Just west of the Dupuis cemetery and the old church, in a draw filled with wild plums and chokecherries, the Dupree Spring (called the Circle P Spring, or Garrett Spring today) still furnishes clear, sweet water. Imagine the hundreds of trips made to this spring, winter and summer, to haul water for the Dupuis family living down the hill by the river in the 1800’s. 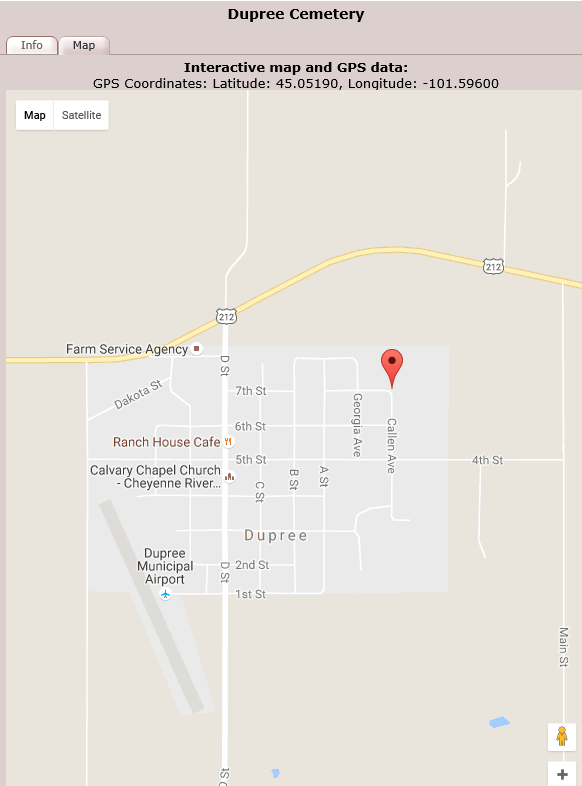 The name, though changed from Dupuis to Dupris and in some cases to Dupree, has been carried all over South Dakota and to probably every state in the U.S. by their hundreds of descendants. Calvin Dupree is the son of Adelia Fielder and Jonas E. Dupris; son of Sarah Red Horse and Frank Dupris; son of Harriet Cadotte and Xavier (David) Dupuis; son of Mary Ann Good Elk Woman and Frederick Dupuis. Calvin Dupree is presently a member of the faculty of Education at the University of Lethbridge in Alberta, Canada. FindAGrave lists Fred DuPris’s birth date as September 5, 1819 and his death as July 16, 1898. His wife, Mary Ann, born as Good Elk Woman, is shown as being born in 1824 and passing over on February 13, 1900. The maps below are from FindAGrave. John descends from Chief Hump twice, apparently through two different wives; Beautiful Hail and White Calf. John Iron Moccasin’s family information indicates that Hump had 4 wives: Good Voice/Good Woman, Brings Her, Stands As A Woman and Bessie/White Calf Woman. The census provides information about Beautiful Hail and White Calf, but we have no further information about Humps’s other two wives. Hump, also known as Thomas Hump, lived until December 11, 1908 where he died in Cherry Creek, SD. Born in Montana, Hump became a leader of the Cherry Creek Band of Minneconjou Sioux. In 1876 he fought in the Battle of the Rosebud against Gen. Crook, shown below in the wood engraving below depicting the Sioux charging Colonel Royall’s attachment on June 17th. Hump also fought on Calhoun Hill in the Battle of the Little Big Horn with Crazy Horse, Gall and others against Custer and the 7th Calvary on June 25th where he received a bullet wound in his leg, according to the National Park Service. The Lakota Museum and Cultural Center tells us the following about Hump. Captain Ezra Ewers – an old friend – was sent to speak with Hump. Ewers convinced Hump of the futility in armed resistance. At this point, Hump separated his band from the Dancers and led them to the Pine Ridge Agency. As Hump was breaking camp, refugees from Sitting Bull’s group arrived and related how their leader had been killed during an arrest attempt. Sitting Bull’s people were eager to find allies as they sought revenge. Hump refused to help, and the refugees set out to join Big Foot near Wounded Knee Creek. According to records provided by John Iron Moccasin’s family, Hump’s father was Iron Bull “TaTankaMaza”, and his mother was Ziti “Yellow Lodge”. Hump was born about 1848 when his father was 28 and his mother was 21. This photo was taken ca. 1879 by photographer by L.A. Huffman. The notation is that the photo is of Hump and his favorite wives. One of these women could well have been Beautiful Hail given that she appears to have had children in both 1882 and 1883 with Hump. He does look to be significantly older than the women. 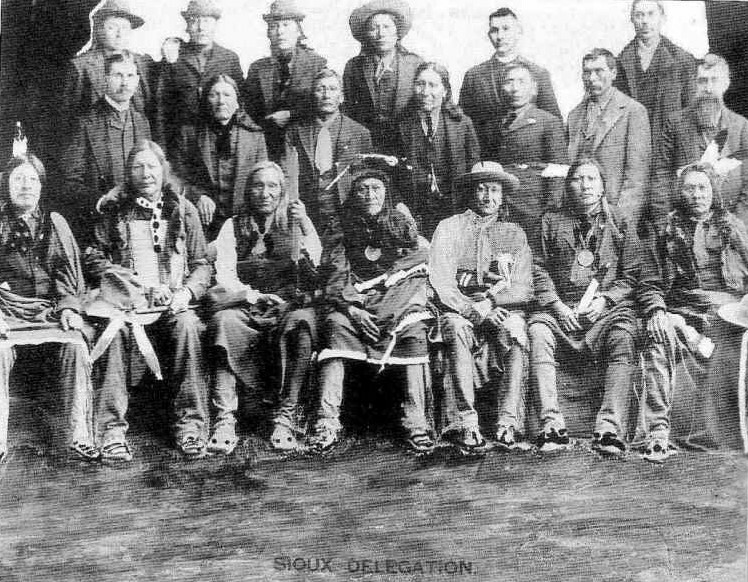 Hump is shown with other Sioux leaders in this 1891 photograph. In the 1900 federal census of the Cheyenne River Indian Reservation, district 48 in Sterling County, SD, the last census in which Hump was alive, he is shown on the census as having been married 20 years, born in April 1850 in Montana, with both of his parents born in the same place. He is a Ration Indian and he does not read, write or speak English. In the special inquiries section, he is listed as Sioux, his father as Sioux Cheyenne and his mother as Sioux. He is listed as entirely Native and in this census, is not listed as polygamous. His wife is listed on the next page as White Calf to whom he has been married for 20 years, so dating back to 1880. Of course, as suggested by the picture taken circa 1879 and the 1886 census in which Hump is married to 26 year old Beautiful Hail, White Calf was not his only wife. Given that Pretty Voice appeared in the census in 1876 with Beautiful Hail as a young child, I would presume that Beautiful Hail is Pretty Voice’s mother. Dora, who was born in 1891, is not shown living with Hump. I cannot find her elsewhere on the census. However, remember that Native people changed their names. Hope is listed as being born in July of 1889 in Montana. In the 1917 Indian Census, Hope Hump is also listed as Dora, age 26, married to Willie Ward who was born in 1889. This shows us that Dora is Hope or Hoop Hump on the earlier census records. According to the 1900 census, Hope was born in July of 1889 in Montana, as were both of her parents. She does not read, write or speak English. She is 100% Sioux. Born in Montana in 1848 or 1850, Hump became a leader of the Cherry Creek band of Minneconjou Sioux. In 1876 he fought in the Battle of the Rose bud against General George Crook and in the Battle of the Little Big Horn. He later joined Sitting Bull’s band and other exiles in Canada. Being considered American Indians, the exiles received no rations from the Canadian government. By 1881 the buffalo and other game were disappearing and the exiles returned to Fort Buford where they surrendered. They were taken to Fort Yates by steamboat. Later the Minneconjou under Hump and Fool Heart and the Sans Arc, led by Spotted Eagle and Circle Bear, were taken down the Missouri River to the Cheyenne River Agency, near their traditional camping grounds along the Cherry Creek and Cheyenne River. 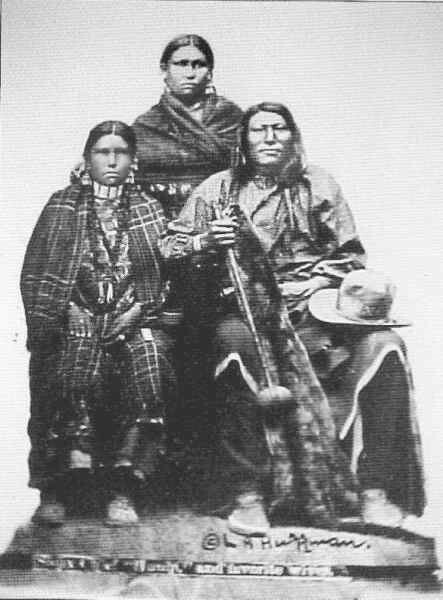 They arrived at the Cheyenne River by May of 1882 and many of the Minneconjou settled near Cherry Creek, 50 miles west of the agency. Hump and Big Foot became the most influential men on the Cheyenne River. The Cherry Creek/Hump Band greatly opposed the land agreements of 1888 and 1889. In 1890, the Ghost Dance found its greatest following in the Cherry Creek camps. After Sitting Bull was killed on the Grand River, many of his followers fled south and camped a few miles above the junction of the Cherry Creek and Cheyenne River. When the army at Fort Bennett moved to suppress the Ghost Dancing, Hump used his influence against the Ghost Dance. In the dead of winter he rode with two men from the garrison and two other scouts, 40 miles to persuade the Sitting Bull camp to surrender and move to Fort Bennett. Those who did not surrender joined Spotted Elk, also known as Big Foot. 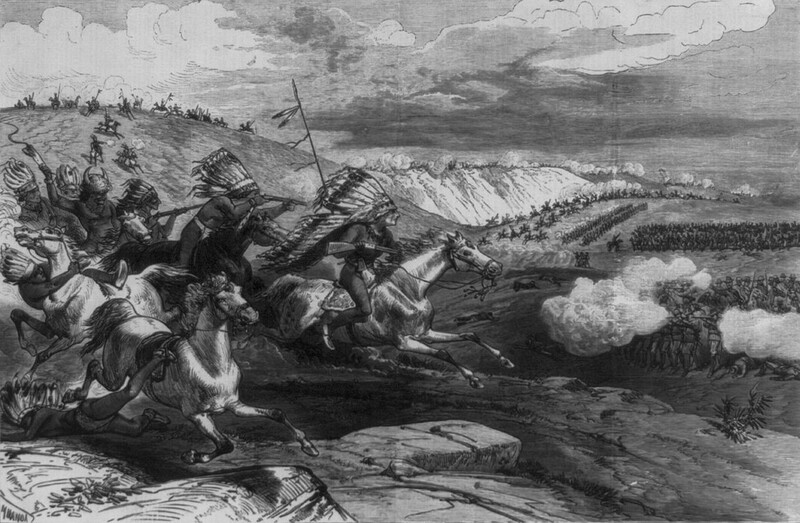 When his band later fled toward Pine Ridge, they were met by the Army at Wounded Knee. Hump was given 500 heifers for his service to the United States Government. These he turned loose, to share with his people. The heifers wandered near Leslie and many died of pinkeye. Hump continued to work for his tribe until his death in 1908. He is buried in Cherry Creek. Hump (Thomas) was born in 1850 to Mashes His Nails/Iron Bull and Ziti/Mrs. Iron Bull (1827-1917) in Montana. Hump’s brother, Little Crow, had been born in 1844. Hump’s sister, White Cow, married Fish (d. 1919) and had a son, James Fish (b. 1889) and a daughter. They lived on Rosebud. Hump grew up in Montana. He had three or four wives, some of whom lived in Montana and were Crow. While the Indians still roved in bands, he started to gather them together, to settle down and become ‘civilized’. Hump came down the Missouri River when the Army brought them to the Cheyenne River on boats. Their stock were driven over land. Bertha Lyman Hump’s mother’s family came from Montana with Hump’s band. Hump even joined the Army to work toward settling down. He was a scout from December of 1890 until June of 1891. He was discharged at Fort Bennett. There were three Hump Flats. One east of Bridger, one by Iron Lightning and one across from Cherry Creek. All are so named because he lived on them. On the way to Montana for a visit, Hump camped with Iron Lightning on the Moreau River. At that time they chose their allotments. Iron Lightning community was later named for Iron Lightning after he moved there. Hump had several wives. His son, by Good Voice/Good Woman, was Samuel Helper/ Stand by of Oglala, born in 1876. Hump’s wife, White Calf/Bessie (d. 1915) was the mother of Pretty Voice/Nellie (b. 1882: Mrs. Alfred Ward); Important Woman/Sarah (b.1884: Mrs. Silas Yellow Owl); Spotted Bear who died in infancy; Dora (b.1891: Mrs. William Ward); Didn’t Drop/Nelson Hump, born in 1898 (no issue); William Miles Hump, born in 1900 and died in 1917 at Dupree, (no issue); and John Hump, born in 1904. 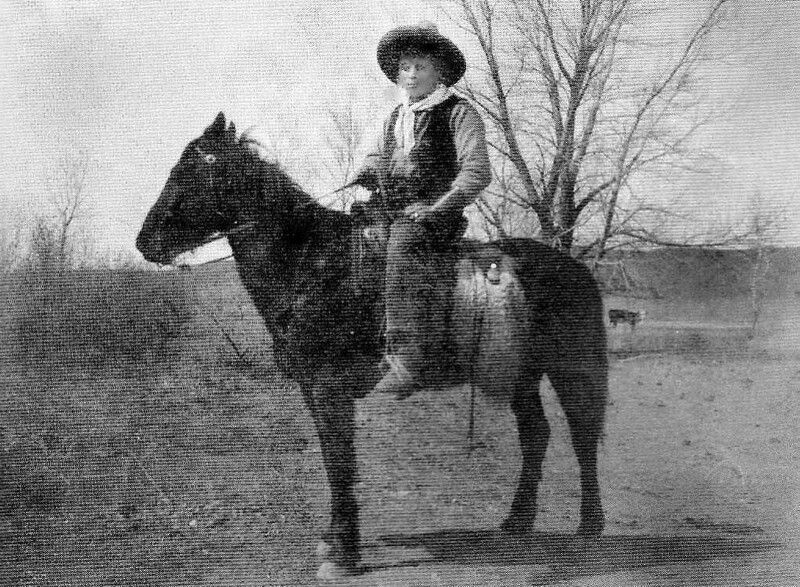 John Hump was born at Cherry Creek, four years before his father’s death in 1908. Hump is buried at the Episcopal Cemetery in Cherry Creek. John went to Carson Day School, Pierre Indian School and Rapid City Indian School. In 1935 or 1936, he married Bertha Lyman, daughter of Ed Lyman. John transferred his heir ship lands from the Moreau River to Red Scaffold. Bertha’s sons, Duane and Darrell, now run the ranch. Darrell is married to Alvina Runs After and Duane is married to Doris Halfred. The 1910 census taken at Cherry Creek station shows us that White Calf’s mother was Roan Hair, age 72, so born about 1838. She shows the birth of only one child. The special inquiries section tells us that she is Teton Sioux, full Native, married once, not polygamous, lived in an aboriginal dwelling and received her allotment in 1903. Roan Hair is shown in the Indian census of the Cheyenne River Sioux in 1896 as the wife of Ragged, both age 56. Four years later, in 1901, they are shown again. 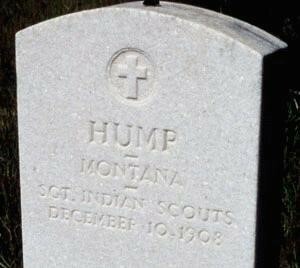 Hump died on December 10, 1908 and is buried in the Episcopal Cemetery in Cherry Creek, SD. Hump’s Memorial at FindAGrave adds some additional information not found elsewhere. Native American Chief. 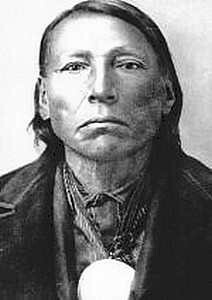 Sioux name “Etokeah.” Although very little is known about Hump’s early life, he eventually rose to become a Chief among the Miniconjou Sioux and was an active participant in the Red Cloud war. 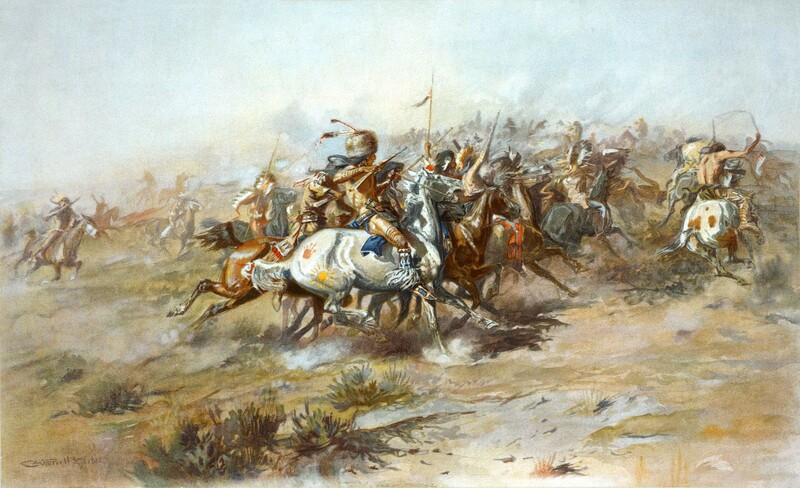 With Crazy Horse at the Rosebud Battle against George Crook, Hump led his Miniconjou Sioux, helping stop the column in their trek to meet Custer prior to the Little Big Horn. At the Little Big Horn, when the alarm was sounded, Hump jumped onto an unknown mount, and it which threw him to the ground. Hump rushed, mounted another horse and charged toward the soldiers. His horse was shot from under him and a bullet entered above the horse’s knee and went further into Hump’s hip. Hump was strained there due to the wound and did not participate in the main battle. Later, Hump went to Canada, and his band returned to the United States, the last of all the bands to return. On the reservation when other tribes had adopted white dress and housing, Hump’s band settled at Cherry Creek in South Dakota and maintained the old ways using lodges and traditional clothing. On the reservation when the authority of other chiefs wained, Hump continued to assert leadership over his band. 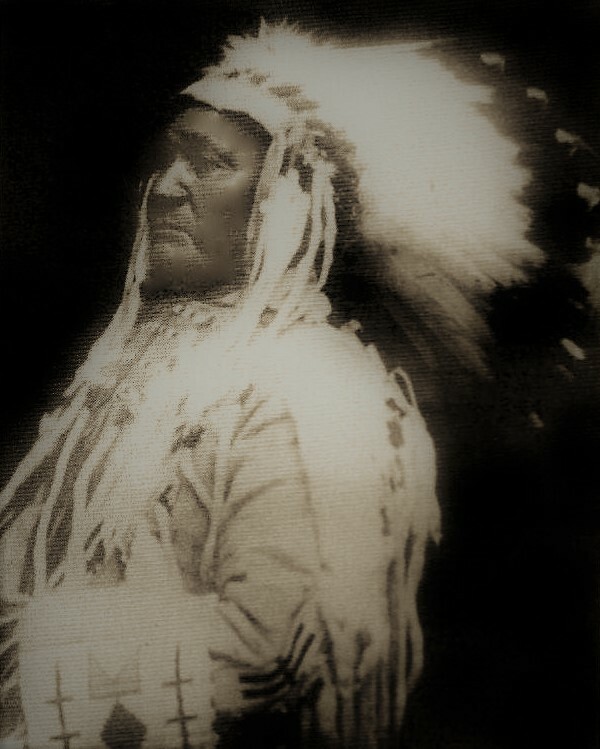 Some said that Hump was feared by the whites even more than Sitting Bull. When the Ghost Dance religion surfaced among the Sioux, the military did not dare arrest Hump. Instead, they reassigned Captain Ezra Ewers, a trusted friend of the chief, to Fort Bennet in South Dakota. Ewers rode the 60 miles to Hump’s camp at Cherry Creek. Impressed with Ewer’s courage, Hump listened to his message and avoided the Ghost Dance religion. After the Wounded Knee Massacre, Hump along with other prominent Sioux went to Washington, DC pleading for a peaceful end to the tragedy. Interestingly enough, it was also Hump who taught the basic lessons of warfare to his better-known student, Crazy Horse. His grave is located on the west edge of the town of Cherry Creek. John’s mother was the daughter of Isabelle Ward and Robert Hale. 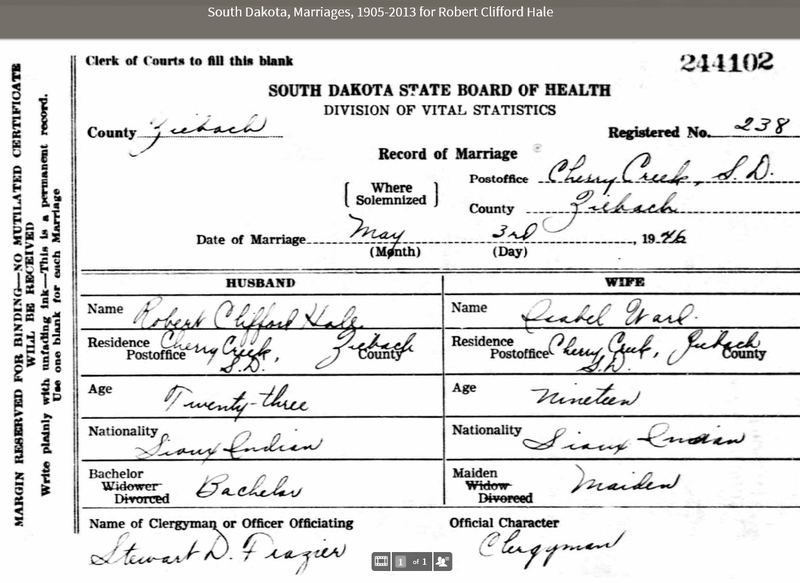 South Dakota Marriage records show that Robert Clifford Hale, age 23, married Isabel Ward on May 3, 1946. Both lived in Cherry Creek, SD. Robert died on August 1, 2008. His photo and obituary are shown below. The US Department of Veteran’s Affairs BIRLS Death File lists Robert Hale’s birth and death dates and his service branch as Navy from July 24, 1942 to November 27, 1942. The Social Security death index shows that Robert was born on Sept. 7, 1922. I cannot find this family in 1920, 1930 or 1940 in the census, nor in the Indian census. It’s possible that the parents and siblings names are incorrect or nicknames. Robert’s parents were given as Joseph Hale and Ellen in his obituary. John’s mother reports that Joseph Hale’s name was Joseph “Blows on Himself” and that this is the end of that line because they migrated from Canada on “the big trail.” I found nothing about this family at Ancestry or utilizing Google. It’s possible that the family was not living as a nuclear family as a recognizable unit. The 1940 census shows a Joseph Hale, age 48, widowed, an Indian, as an inmate in the Davison County, South Dakota Jail, but we don’t know if this is the same Joseph Hale. However, this is the only Joseph Hale in South Dakota, or for that matter, in that part of the country. This Joseph was widowed, an Indian and born on an Indian Reservation, so it may well be the correct Joseph. It would be interesting to see if any court records still exist relative to this case. I found scanty information on the following individuals from the obituary listing them as siblings of Robert Clifford Hale. Claira Hale – married Elmer Fritz on February 27, 1962 , born about 1926. Mytrle Hale – Myrtle Faye Hale married Theophil Little Shield and died in SD at age 65. Martin Hale – if the same Martin, died in 1935 of appendicitis, age 20. 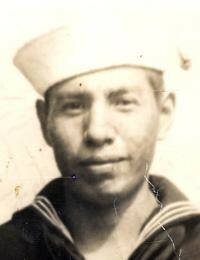 Wilson Hale born about 1921 married Eunice Eagle Horse. He died in 1950 in Ziebach County. In the 1940 census he is living with the Straight Head family which would make sense if his mother was deceased and his father was in jail. 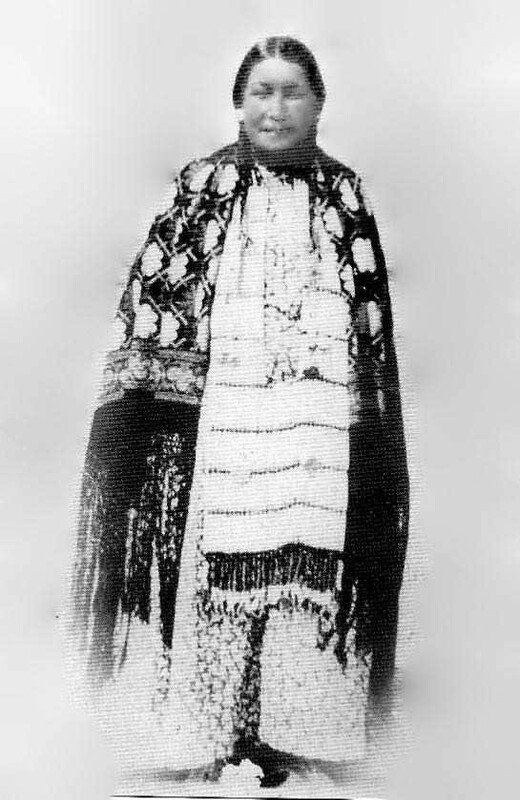 John Iron Moccasin’s grandmother on his mother’s side was Isabella Ward, born in 1925 or 1927. The 1930 Federal census shows Isabella Ward, age 5, living with her parents in Ziebach County, SD. Her mother, Dora is listed as a full blood and her father, William, a mixed blood, all born in South Dakota and Sioux. Her father is listed as a farmer. We’ve already met Dora (Hope) Hump, daughter of Chief Hump and probably White Calf and William Ward, son of Clarence “Roan Bear” Ward and Estella Dupris. Now for the most exciting part – the DNA results. Do John’s DNA results bear out his genealogy? John’s tribal card says that he is at least 15/16th Native. That is accurate, given that he is 1/16th French on both his mother and father’s sides, from the same ancestor. In percentages, for autosomal DNA, that translates into 6.25% white and 93.75% Native. When I’m working with descendants of tribes located east of the Mississippi, I understand that they are very likely heavily admixed with (primarily) European males, and significantly so prior to 1800 and in most cases, prior to 1700. However, the Sioux are somewhat different. Except for occasional traders and missionaries, they essentially escaped the widespread influence of Europeans until the 1800s. With few exceptions, I would not expect to find earlier mixing with Europeans, meaning English, French or Spanish, or Africans. Because of the history of the Sioux tribe, the sheer number of Sioux across a wide geography, and the lack of early European admixture, John’s DNA represents an opportunity to obtain a genetic view of a people not significantly admixed. 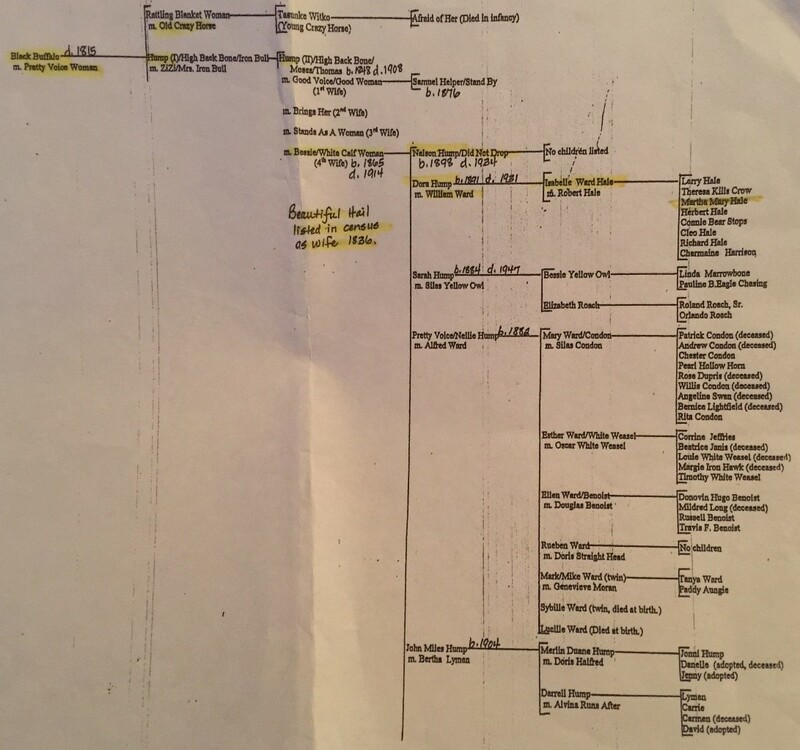 We know from John’s family tree that he shares at least 3 ancestors and possibly 4 on both his mother’s and father’s side of the family. Those ancestors are 4 generations up the tree from John. In most cases, one’s great-great-grandparents would each contribute, on average, 6.25% of your DNA. In John’s case, he received a double dose of the DNA of each of those ancestors. If John received the exact same DNA from those ancestors, from both sides, he would still only have 6.25 % of their DNA. This is very unlikely, because normally siblings share part of their parent’s DNA, but not all of it. Conversely, it would be very unlikely for John to inherit none of the same DNA from that ancestor from both lines. Therefore, it’s most likely that instead of 6.25% of the DNA from that each ancestor who is found twice at 4 generations, he would carry about 9.38% of their DNA, or about half a generation closer than one would expect. And that goes for all 3 common ancestors. We’re not sure which of Hump’s wives gave birth to which children, so this could also apply to Hump’s wife, a 4th ancestor. Furthermore, these individuals in the tribes are likely already very heavily inter-married and related to each other, long before any records. There were only a limited number of people to select as mates, and all of those people also descended from the same ancestors, who were part of a very small foundation population that migrated from Asia some 10,000 to 25,000 years ago, depending on which model you subscribe to. Therefore, endogamy and pedigree collapse where one shares common known ancestors would be a phenomenon that has occurred since the time of Anzick Child, and before. We tested John’s DNA at Family Tree DNA where his Y, mitochondrial and autosomal DNA was tested. John’s Y DNA shows us the deep ancestry of the White Weasel line. The mitochondrial shows us the deep ancestry of Dora (Hope or Hoop) Hump, daughter of Hump, presumably through wife, White Calf. John’s autosomal DNA shows us an overall ethnicity view, plus matches to autosomal cousins. Let’s see what we have. John’s myOrigins results show that he is roughly 17% European and the rest a combination of Native and Asian that together represents 84%. One of the aspects that I find most interesting is that the portion of Europe that shows a genetic link is Finland, not France where 6.25% of John’s paper trail ancestry is from. Finland is particularly interesting in light of the result of the Clovis Anzick Child burial found in Montana that dates from about 12,500 years ago. We have the Anzick Child’s results in the Family Tree DNA data base, compliments of both Felix Immanuel and Family Tree DNA. The Anzick child’s myOrigins results are shown below. The Anzick Child’s DNA ethnic results are very similar to John’s. Anzick Child matches the reference population for Finland at 11%, where John matches at 17%. Furthermore, John Iron Moccasin is one of 110 people in the data base today that actually match the Anzick Child’s DNA at contemporary levels. No minimum number of shared cM required, but if the cM total is less than 20, then at least one segment must be 9cM or larger. If the longest block of shared DNA is greater than 9cM, the match will show regardless of total shared cM or the number of matching segments. Lowering the match threshold to 3cM, we can see several small segments that match between John and the Anzick Child. I downloaded their common matching segments. Their largest matching segments are on chromosome 19 for 7.87 cM and on 16 for 5.49 cM. The genetic connection between the Anzick Child and John Iron Moccasin is evident. John’s tribe is descended from the same people as the Anzick Child who was buried in present day Montana. John’s ancestors, Hump, Roan Hair and Follows were all born in Montana, and the Sioux homelands stretched across this entire region. This begs the question of whether John is simply lucky to have inherited these segments, or if they are found widely in the Native, particularly Sioux, population as a whole. 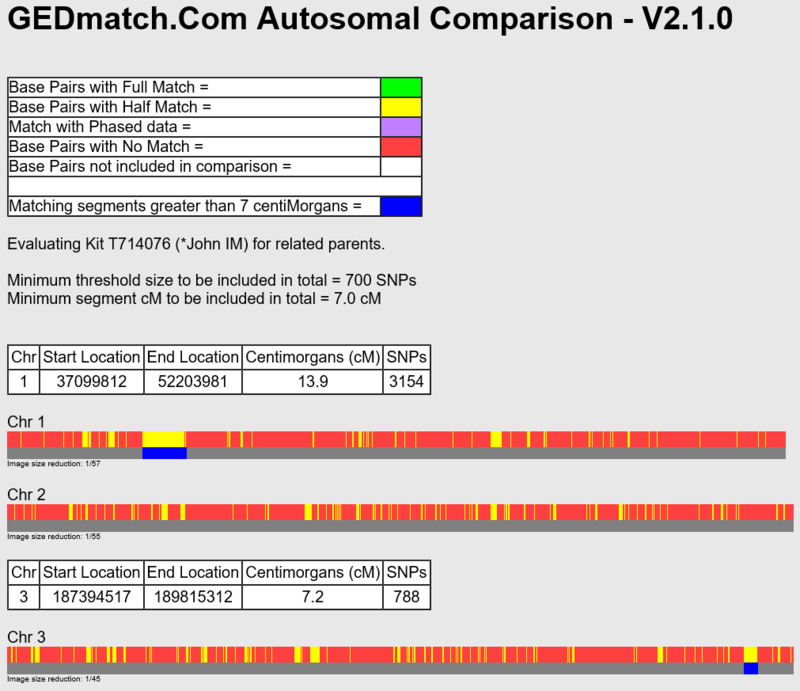 To help answer this question, I looked at John’s closest 4 matches along with the Anzick Child in the chromosome browser, compared to John’s DNA. 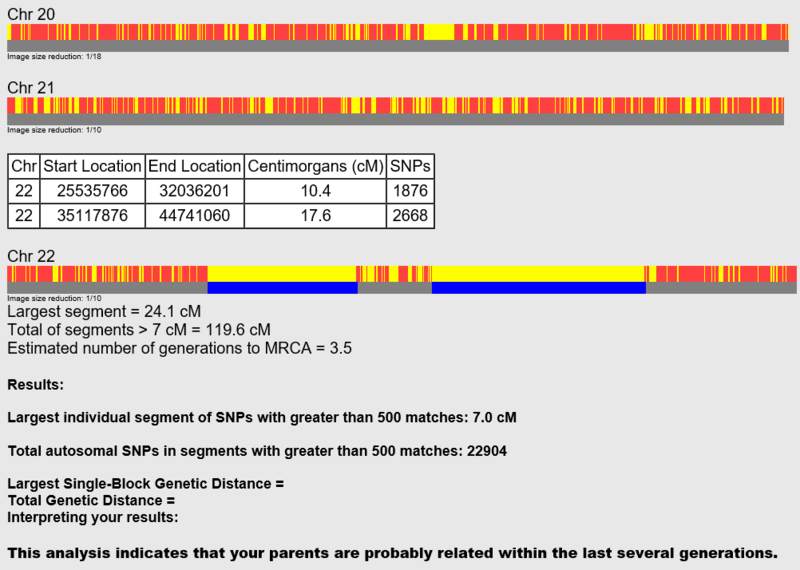 At 5cM there is no overlap with John’s closest matches and the Anzick Child, whose DNA is shown in green, above. However, dropping the threshold to 3, below, shows overlap with Thomas’s closest match on chromosome 19 at 4.98 cM and other chromosomes in smaller amounts. This would suggest that perhaps the DNA that is the same as the Anzick Child’s does not repose in the entire tribal population. Let’s take a look another way. At GedMatch, John matches the Anzick Child on slightly different segments than at Family Tree DNA. It’s not unusual for different vendors to produce slightly different results. In this case, the match on chromosome 16 is absent altogether, and there are larger segment matches on chromosomes 8 and 14 using a 5cM and 500 SNP threshold. 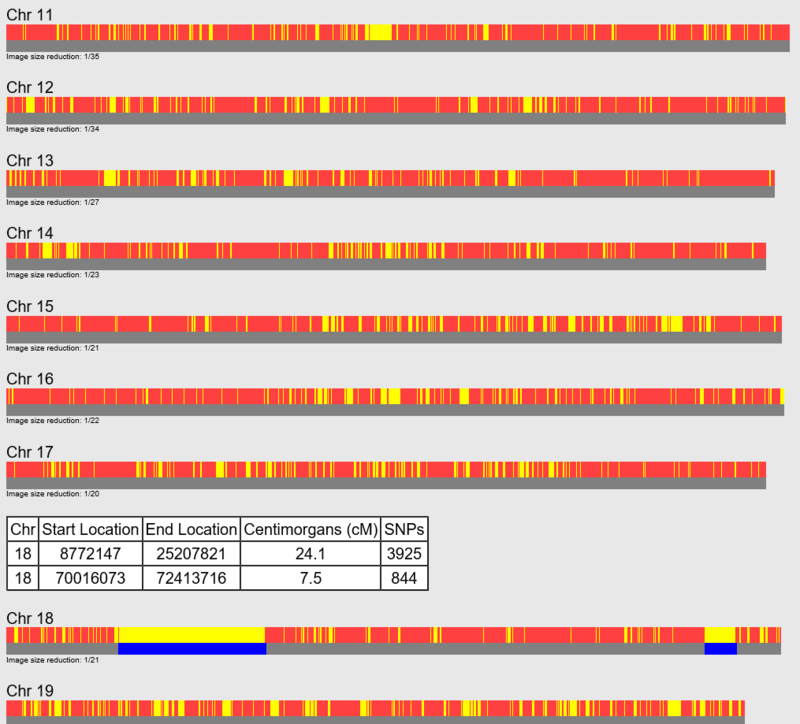 Chromosome 22 shows a match not present at Family Tree DNA. I was curious to see how many people matched John on his segments shared with the Anzick Child. John matches a total of 2119 people at GedMatch at 5cM and 500 SNPs. 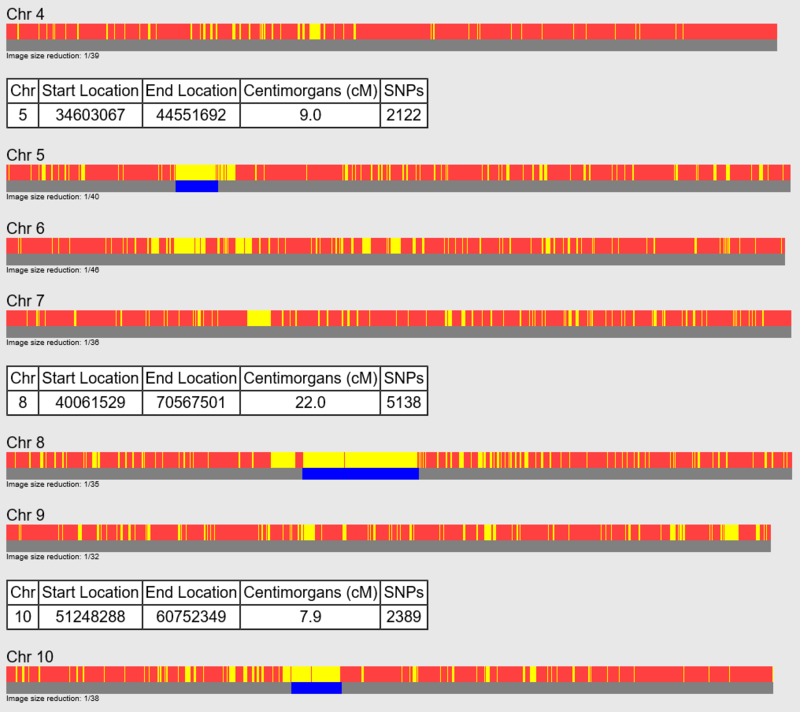 John’s results for his two largest segments, chromosome 16 (at FTDNA) and 19 were different. Chromosome 16, the smaller match, was generally unremarkable, but his chromosome 19 was a different story, carrying many names and surnames that I recognize. Let’s take a look at the triangulation tool and see what we find there. We are looking for anyone who triangulates with both John and Anzick Child. This tool reports every triangulated match in excess of 5cM. Using the triangulation tool, no one triangulates, meaning matches both John and the Anzick child, on either chromosome 16 or 19. This suggests that all of John’s matches showing are on the “other” chromosome and that this chromosome segment is fairly rare. If one of John’s parents were to test, we could identify which of John’s parents was matching Anzick, so we would know which side of John’s family these individuals are matching on these segments, assuming these matches are not identical by chance. Out of curiosity, I triangulated Anzick Child’s kit to see if there were any triangulated groups. There were, but none that included John. At GedMatch, let’s use the “Are Your Parents Related?” utility. We know that John’s parents are related, but are any of the segments that came from both parents the same segment that is found in John’s Anzick match? The match threshold at GedMatch for this tool is 7cM and 700 SNPs, so the only segment that would qualify would be this segment on chromosome 19, shown above in green. The “Are Your Parents Related?” tool at GedMatch shows the following results. According to GedMatch, this segment of chromosome 19 was not contributed by both of John’s parents, so this portion of the Anzick DNA is not found universally in the entire Native population in that region. 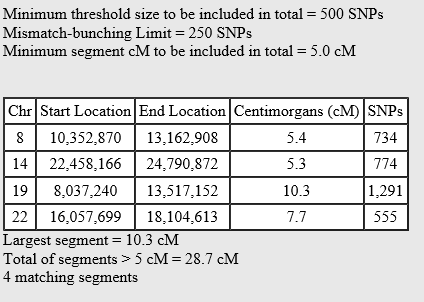 One last look at John’s DNA by comparing to the Ancient group contributed at GedMatch shows no segments 4cM or above that match with any ancient specimen other than the Clovis (Anzick) Child, including no match to the Paleo Eskimo in Greenland from 4,000 years ago and no match to Kennewick Man. 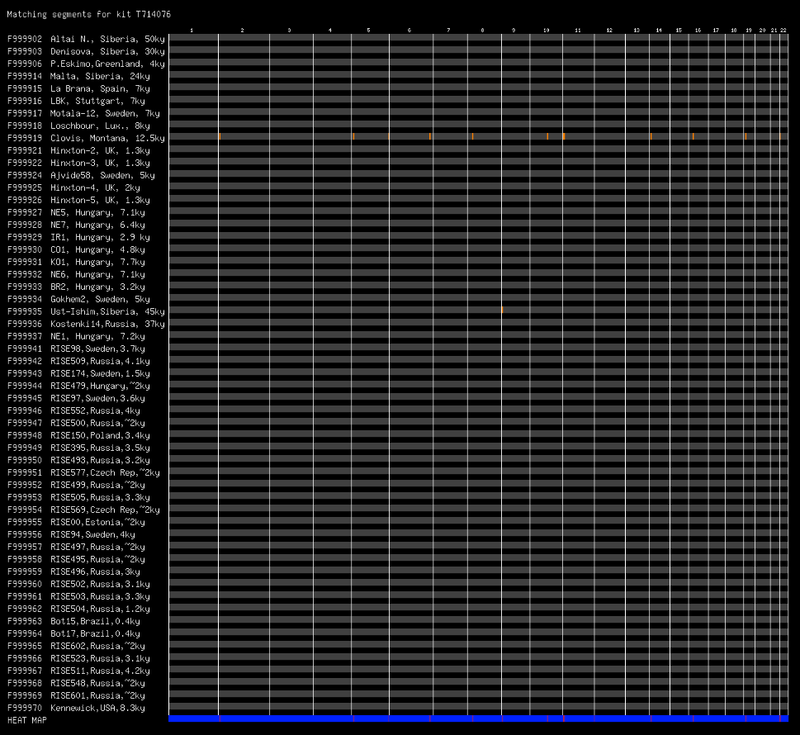 The tiny orange bars represent matching segments at 400 SNPs and 4cM. John’s mitochondrial DNA comes directly from his matrilineal line, meaning from his mother, her mother, her mother, on up the tree until you run out of direct line mothers. In this case, that person winds up being Hump’s wife. We think that person is probably White Calf, but it could be one of Hump’s other wives. We just don’t know for sure given that Hump was polygamous. Mitochondrial DNA is passed intact in each generation, doesn’t get combined with the father’s DNA so it’s a direct line back in time. Johns’s mitochondrial haplogroup is clearly Native, C4c1. Haplogroup C4c1 was originally reported in the Suswap by Ripan Malhi; in the Chippewa Creek and in Jasper House, Alberta Canada, in 2015 by Roberta Estes from the American Indian project. 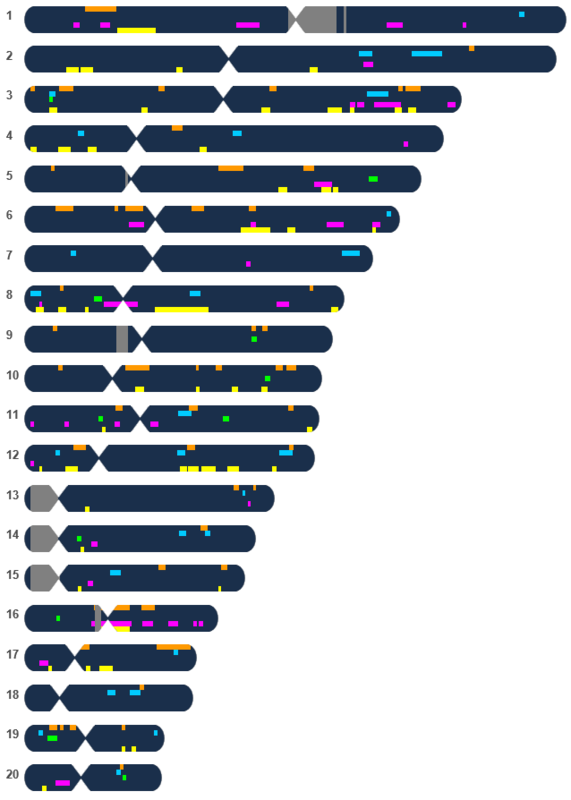 At the HVR1 level, John has 62 exact matches, but he has no matches at the HVR2 or full sequence levels. This means that of the people who have tested at that level, he has more than 4 differences at the full sequence level. Translated, this means they don’t share common ancestors in hundreds to thousands of years. Only 8 of John’s HVR1 matches have tested at the full sequence level, unfortunately. Of those, the earliest ancestors are Spanish, indicating that they are probably from either the American southwest, or further south, and their haplogroup C ancestor was eventually associated with the Spanish. One is from New Mexico. One is from Michigan. Few of John’s matches have entered the location of their most distant ancestor, but those who have provided that information are shown below at the HVR1 level, understanding that a common ancestor at that level could predate the migration into the Americas. Utilizing the information provided through the Genographic project, we find the following information about haplogroup C4c1. This provides very interesting geographic distribution information, but it also begs the question of how haplogroup C4c1 was found in Germany or Sweden. Of course, we are relying on participant-reported information and it’s certainly possible that two individuals misunderstood the directions. It’s also possible that one or both are legitimate. I have wondered for a long time about a link between the northern Scandinavian populations, especially subarctic, and the Native subarctic populations in North America. According to Dr. Doron Behar in the supplement to his paper titled, “A “Copernican” Reassessment of the Human Mitochondrial DNA Tree from its Root,” haplogroup C4c1 was born about 10,095 years ago with a standard deviation of 4550 years, meaning the range of time in which C4c1 was born in likely 5,545 to 14,645 years ago. Clearly, there is enough latitude in this date range for some C4c1 to be found in either Asia or Europe, and C4c1 to be found in the Americas as well. If this is indeed the case, one would expect for the variants of C4c1 found on the differing continents to contain a significant difference in mutations, exceeding the 4 mutations allowed for genealogical matching purposes at Family Tree DNA. To date, there has been no ancient DNA recovered bearing this haplogroup. Testing a female descended through Pretty Voice, mother of Esther Ward, would determine whether or not White Calf was the mother of Pretty Voice, or if it was another woman, probably Beautiful Hail. 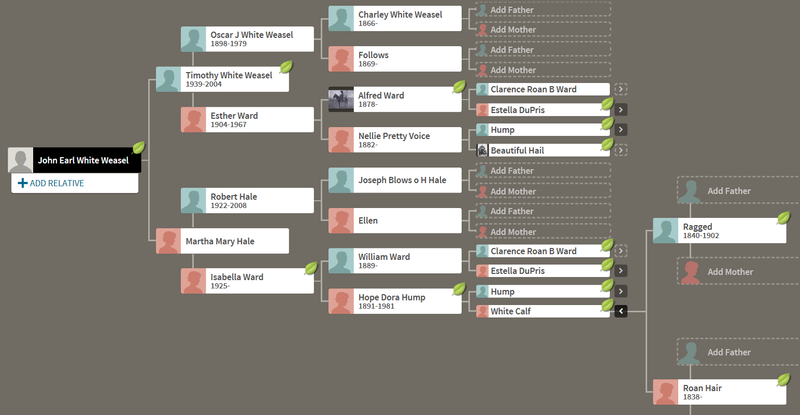 John inherited his Y DNA chromosome from Charley White Weasel. John’s Y haplogroup is Q-M242, a Native haplogroup. John tested to the 67 marker level, but has no matches at 67 markers. At 12, 25 and 37 markers, he matches a gentleman whose ancestor was from Fort Thomson, SD who also tested at 67 markers. That is John’s only match, so apparently John carries some unusual mutations in his Y DNA as well that are probably isolated to people from the Sioux tribe or their ancestors in the past a few hundred to thousands of years. On the map above, John’s match is shown and on the map below, John’s white balloon is shown where he was born in relation to that of his red balloon match. To obtain additional information about John’s Y DNA haplogroup, the Big Y test would need to be run on his sample. By running the Big Y, we could obtain a more granular haplogroup, meaning further down the tree, and we could also see who matches him more distantly, meaning further back in time. That information could well provide us with information indicating which groups of Native people John is most closely related to. That suggests a migration route or pathway and tells us about social interactions at some level hundreds to thousands of years in the past. 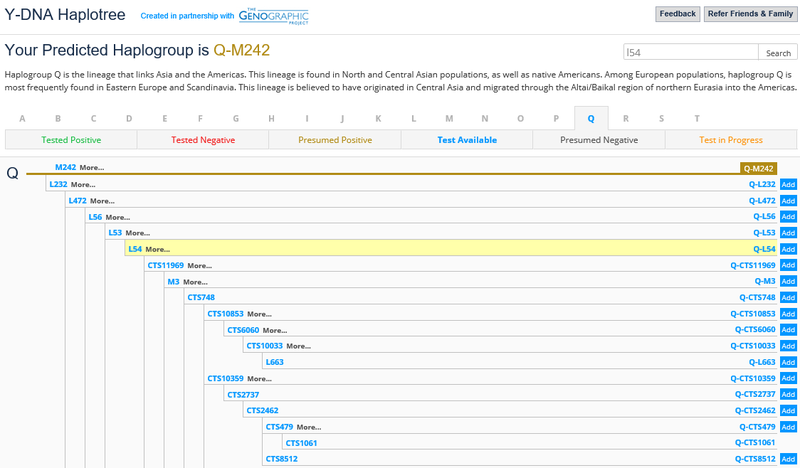 Anzick Child’s Y DNA haplogroup is Q-L54, a subgroup of Q-M242, shown on the haplotree below. You can also see that many subgroups below L54 have been discovered. I strongly suspect that John’s haplogroup would be Q-L54 or a subgroup further downstream. I’m betting on a subgroup, meaning that mutations have occurred in John’s line that define a newer, younger haplogroup since the time that Anzick Child and John shared a common ancestor. 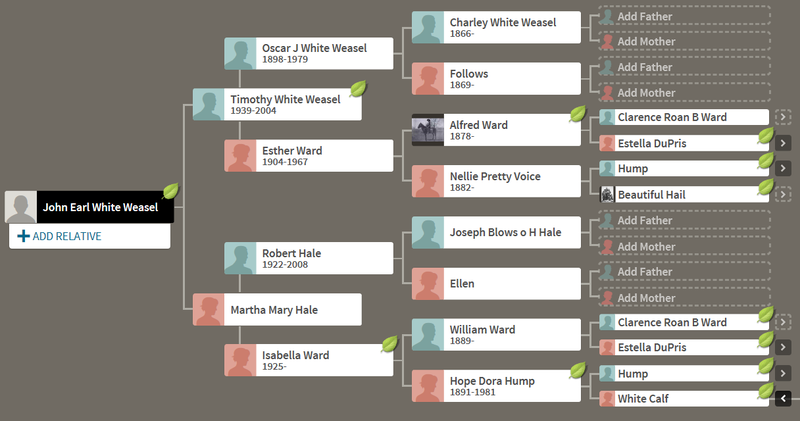 I was hopeful that I would find results for John’s Ward or Hale line in the projects at Family Tree DNA, but I did not. I checked in the American Indian project for Hump, with the hope that one of his descendants has tested as well, but did not find that Hump is yet represented in the data base. Of course, anyone paternally descended from Hump’s father, Iron Bull or his father, Black Buffalo would carry the same Y DNA. If anyone descends from these direct Y lines, please do let us know. What we have been able to discover about John’s ancestry both through traditional genealogy and genetic genealogy has been both amazing and fascinating. Anzick has given John a wonderful gift, and John has given that gift to the rest of us. We continue to learn through both John and Anzick’s contributions. Thank you to both. I would very much like to upgrade John’s Y DNA to 111 markers and order a Big Y test while the holiday sale is in effect. If you would like to contribute to these tests of discovery, please donate to the American Indian project general fund at this link. If we raise more than we need for John’s tests, we have implemented an application process for other Native people. Every donation helps, and helps to build our knowledge base – so please contribute if you can. John Iron Moccasin for testing, providing family information and allowing us to work with and publish his results. John’s mother, Martha Hale, for providing the original genealogical information, below. Johns’ friend, Pam, for bringing us this opportunity. John’s wife, Carolyn, for coordinating information. Family Tree DNA for testing and facilitating the Ancient DNA Project, the American Indian Project and various Native American haplogroup projects. Project members and others for contributions to facilitate John’s testing. My American Indian project co-administrators, Marie Rundquist and Dr. David Pike for their never-failing support. This entry was posted in Algonquian, Canada, Chippewa, DNA, Kaskaskian, Mexico, Mohawk, Sioux. Bookmark the permalink. Great thorough article on an a Native American male. I can’t believe no one has commented on his study. I guess people only care when they are try to prove a tenuous myth that their grandma was a Cherokee princess. A real Native American doesn’t grab their attention. John has really got me curious he is matching to my great aunt and uncle at 2nd to 3rd cousins and he is matching to there first cousin on both there maternal and paternal sides. I notice he has Black Buffalo in his family tree the Chief who stopped Lewis and Clark from being killed. Meriwether Lewis is my 4th great grandfather he met my 4th great grandmother Winona at the village of the bad river and accord to oral history she accompanied him to the Mandan Village. The next year Joseph Desmet Lewis 1805-1889 was born. As far as I know Joseph was the only child to be father by Meriwether Lewis. Through Ancestry DNA my family links to Meriwether’s maternal and Paternal side several times over. Great article … I need to do research as was done here. Interesting! I have noticed, having scandinavian Indigenous dna, that i sometimes dna-match native americans. I ´dont know if it is through native heritage or not. 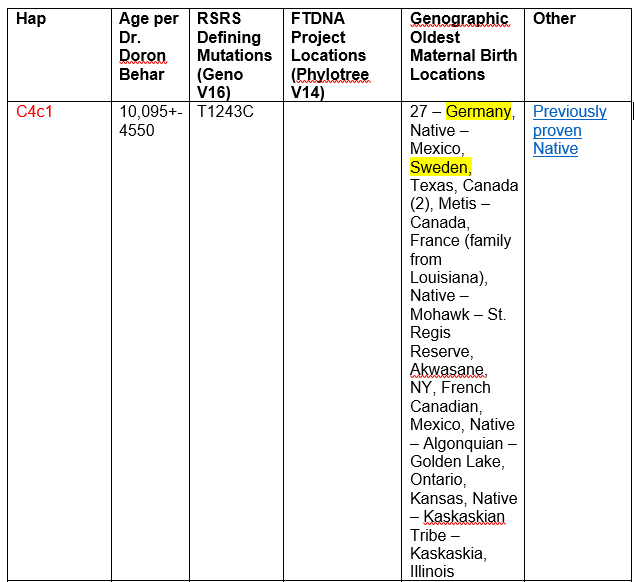 My children tested as inuit, polynesian and siberian on heritage, but ancestry, ftdna and my heritage don´t show sami even though many of the northern swedes, Finns and norwegians have sami-connection in the past. Really fascinating story, and what a blessing dna is proving to be, filling in the many blanks left out of recorded history.